Resurfice Corp. unveiled the Olympia IceBear2007 New Design, with all Stainless Steel Battery Powered Ice Resurfacer, at the 2007 annual NARCE Conference and Trade Show in Chicago, IL. 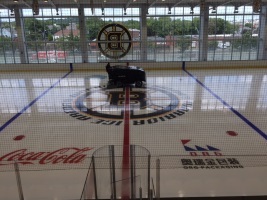 The Olympia IceBear combines the Olympia’s world leading ice resurfacing technology with the IceBear cutting edge electric vehicle components. With all new solid state motor controllers and AC Drive system, in response to an industry demand for a pollution free, safe, efficient, cordless electric powered ice resurfacer, the Olympia IceBear sets a new standard in high performance and low operational costs while producing zero emissions.